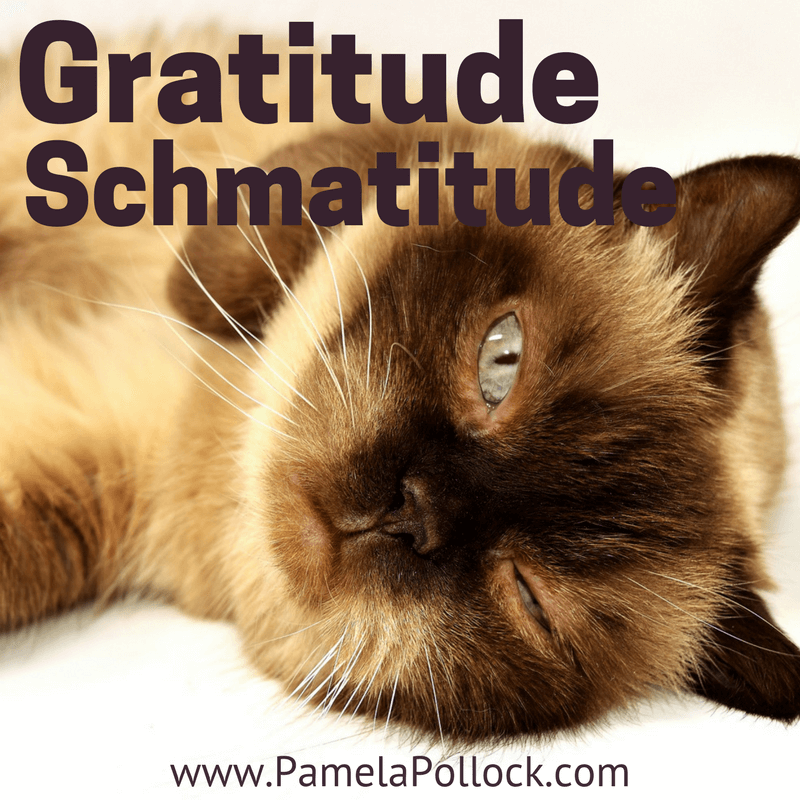 The schmatitude kind of attitude portrayed by the kitty to the left pretty much captures how I used to feel about focusing on gratitude. Don’t get me wrong…I truly believed even then that gratitude was important. I just couldn’t seem to cultivate the ‘attitude’ and keep it going, so my defensive self stepped in and convinced me it wasn’t important. I’ve started and stopped more gratitude lists and journals than I can count. I am happy to say that I am now well on my way to establishing a healthy habit of gratitude as an attitude. How did that happen, you may ask? I no longer do things just because I’m supposed to. I need to have a good reason; one that satisfies my need to understand both how and why something works. Pursuing an attitude of gratitude was no exception. As often happens, it was a convergence of things that caused me to grab hold of gratitude and let it take me for a ride I wasn’t expecting. If you read the two volumes of my book, Dare to Dream: The Art of Co-Creating with God, you know that developing Dare to Dream has been anything but an easy or short journey. The abbreviated version of the story is that God had a lot of things to change in me in order to prepare me to steward this dream. In the past few years I developed a high level of anxiety that drove me to seek God more deeply. In the process, He introduced me to numerous resources that began changing me from the inside out that are now incorporated into Dare to Dream. God doesn’t waste anything. For years I had been helping clients learn how to develop their own inner adult to love and care for themselves. Few of us had great parenting modeled for us. As a result, we often don’t know how to take full responsibility for our own inner landscape. Instead, we develop a self-protective side of ourselves that operates from faulty beliefs and keeps us from the life we really want. I was no exception. I absolutely had to learn new ways to care for myself, and God knew exactly what I needed. God orchestrated an encounter and ultimately a friendship with a woman named Nomi Bachar. She wrote a beautiful book called Gates of Power – Actualize Your True Self (available on Amazon.com) which introduced me to a deeper and more meaningful way of interacting with my inner self that expanded the work I was already doing. I was aware that my anxiety was telling me something. I just didn’t understand what. Nomi’s approach helped me connect more with the anxious part of myself, and I began to access and honor the sources of my anxiety more easily. I felt very grateful for having met Nomi. About the same time, in my effort to find ways to calm my overzealous nervous system, God reminded me of Calm.com. If you aren’t familiar with that website, you can click HERE to explore this amazing resource for relaxation, meditation (with no religious undertones), and mindfulness tools. My journey on Calm.com started with their ‘7 Days of Calm.’ It was so nice to have someone else guide me in daily 10-13 minute mindfulness meditations. By the end of the seven days I wanted more, so I began their ’21 Days of Calm’ practice. Two weeks into the ’21 Days of Calm,’ which was now 3 weeks of daily meditations, I noticed that I felt different. Ok, I’m onto something. My need to validate how and why kicked in. In Volume 1 of Dare to Dream, I wrote a chapter called ‘Neuroplasticity,’ which talks about our brain’s ability to reorganize itself by creating new neural pathways to meet our changing needs. In Volume 2 of Dare to Dream, I wrote a chapter called ‘Change Takes Time.’ I refer to Dr. Caroline Leaf’s research from her book Switch On Your Brain, in which she reveals the science behind our ability to change and then suggests a 21-Day Brain Detox Plan to facilitate deep, effective change through rewiring nerve networks. Hmmm…21 Days of Calm (3 weeks of meditation), rewiring nerve networks, feeling much calmer. Something was working here, and I wanted more. More gratitude was seeping in around the edges. Well, I mentioned earlier that it was a convergence of things that contributed to me grabbing hold of gratitude. About the same time, another God encounter happened. I had been talking with a client about empowering her own inner adult and suggested that she look on Amazon for self-parenting books. My own curiosity took over, and I began exploring Amazon myself. The book Inner Bonding by Margaret Paul jumped out at me. I purchased the book and also purchased Inner Bonding – The Power to Heal Yourself on Audible, which is an Inner Bonding training facilitated by Margaret Paul. I listened to the training several times and was blessed with an even deeper understanding of the role of the inner child (emotional self) that Nomi originally introduced me to. Once again I felt very grateful. Feeling better about myself will never come from doing more. It comes from learning to appreciate who I am and what I have right now. I get more benefit from expressing gratitude for who I am in various circumstances than for just the circumstances themselves. The real benefits of gratitude come when I take the time to not only express my gratitude about someone or something but to allow myself to actually feel the appreciation… lip service isn’t enough. An ‘attitude of gratitude’ is a daily habit that I choose to prioritize. Habits take a minimum of three weeks to establish, so it’s a muscle I must exercise or it will atrophy. The more I look for things to be grateful for, the more I am rewiring my brain to slip into positive thought patterns and the more my negative thought patterns decrease. External reminders can be helpful (I’m working on this one!). For example, I have my Gratitude Journal on my night stand. Even though I am noticing things all day to be grateful for, writing a few things down each night is a great habit to nurture. How about using every time I stop at a red light as an opportunity to look for something to be grateful for. The more I practice expressing gratitude, the more I look for things to be grateful for. What I focus on increases. If I focus on lack, I’ll get more of that. When I focus on gratitude for the ordinary things in my life, the more I will appreciate them. The more I take time to be grateful for the best qualities of people I love, the more good qualities I will see. It’s hard to be grateful and feel lack at the same time. Expressing gratitude is not just for big things. It’s for all the ordinary little things in life that I can easily take for granted (a roof over my head, food in my refrigerator, an alarm clock to wake me up, a hot shower, a toasty bed, a car to drive, a beautiful sunrise or sunset, a helpful co-worker, a smile from a stranger, trees or flowers in bloom, the way I feel when I do something nice for someone or when someone does something nice for me, the sense of accomplishment when I’ve completed a good workout, my heart beating all by itself, my fingers that allow me to write or to touch someone’s face, the sound of wind in the trees, sunshine in the Pacific Northwest!…). I can look for and express gratitude even when things don’t go my way. There is always the possibility of growth from adversity. For example, rather than criticizing a mistake, I can congratulate myself on making the effort. The more I express gratitude for who I am, the better I feel about myself. If I’m ever stuck trying to think of something to be grateful for, I can Google “things to be grateful for” and I will never be at a loss for ideas! What has been most helpful to you in developing an attitude of gratitude?